← How to convert a document of html to tga image? After converting documents to pdf file,you must want to check the file to see whether it is perfect or not. 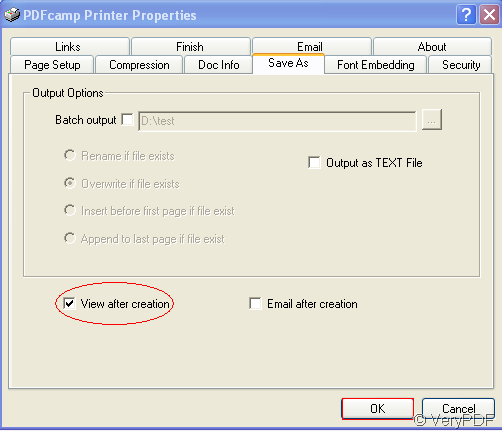 But it’s a little inconvenient to find it in the location you have just set.Don’t worry,PDFcamp Printer will help you to do this more easier.In another word,you can browse the generated pdf file automatically after printing. If you don’t have PDFcamp Printer in your computer,you should load one first and the download website is http://www.verypdf.com/pdfcamp/pdfcamp_setup.exe. 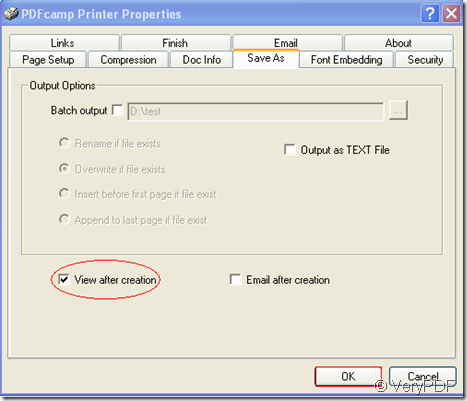 Now PDFcamp Printer will show you the methods. First,of course you should open a document you want to print,such as word,excel,powerpoint and so on.Then click “file”—“print” or right click the blank and click”print” or use the hot key”Ctrl”+”P” directly.This is the beginning of the whole procedure. Second,you should click “properties” in which click “save as”—“view after creation”,the most important button for this function.It means you can browse the pdf file automatically after printing.Then click “ok”. Third,rename or name the created file,select the path and save. All work have been finished and you can see an automatically popping up window which is the new pdf file.With the help of PDFcamp Printer,do you think it’s more easier?I think so.